Copyright (c) 2017 by Lynn D. Johnson. You may reprint this with proper attribution and copyright attached. 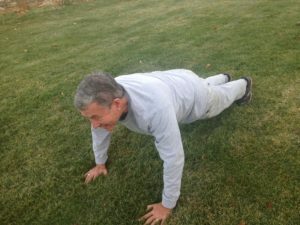 At 71, Lynn does 40 – 50 pushups. Depression is increasing worldwide. It hits us younger, and hits more of us. When I was a new intern in psychology, the average of onset for depression was 37. That was way back in 1975. Twenty years later, the average of onset was 15 That number continues to get lower, as younger children are suffering from depression. It is clear that the younger one is, the higher the risk. Someone who is fifty has half the risk of ever having been depressed as someone who is in the 18-25 age range. It is opposite of how things should be. The longer I live, the greater risk of, say, cancer. But with anxiety and depression it is reversed. I don’t pretend to know all the answers, but I want to suggest a simple practices that dramatically reduce the risk to young people, and to all of us. Traditional treatment does work. Talking to a therapist has a very good impact on depression. Taking an antidepressant does help. Combining those two, the talk and the pills, certainly has the most impact. But it isn’t good enough. Take pills, for example. If you are depressed, and take a medication, you have one chance in three of full recovery. You have one chance in three of improving but not recovering. That leaves a full third without any help. My psychiatrist colleagues call those folks “treatment resistant.” It isn’t that they emotionally resist getting better, they just don’t respond to the pills. If you see a therapist, you have a slightly better chance. Perhaps 40% to 45% are blessed with a full recovery, and about 30% will improve. Yet again, 25% of patients just do not get any better from talking to a head shrinker! Yes, combining the two does improve things somewhat, with more getting fully recovered, but we still cannot help 20% to 25% of depressed patients. In the last few years I have been experimenting with a couple of other interventions. This “prediction task” helps people be less loyal to their depressive thinking. Through the week, they (now the plural pronoun is justified) write down their prediction, they walk 20 minutes, and then rate how they actually feel. Brisk walks of 20 -30 minutes, or similar exercise, give us a very nice response, and some of these folks are people who have not done well with either medication or with psychotherapy. Next time I’ll write about the surprising results from changing what we eat. Walk more and eat healthier. Two simple changes that are yielding impressive results. http://www.sciencedirect.com/science/article/pii/S0890856709642829, retrieved Sept. 25, 2017.
 http://jamanetwork.com/journals/jamapsychiatry/fullarticle/208678, retrieved Sept 25, 2017.
 https://www.nimh.nih.gov/health/statistics/prevalence/major-depression-among-adults.shtml, retrieved Sept 25, 2017.
 http://www.epocrates.com/dacc/1310/ExerciseForDepressionCochrane1310.pdf, retrieved Sept 25, 2017.
 http://www.journalofpsychiatricresearch.com/article/S0022-3956(16)30038-3/fulltext, retrieved Sept 25, 2017. This is great results including exercise and next what we eat to improve depression. We do kinow that meds don’t help everyone. In fact, some people are worse with meds alone even with therapy. One reason is some patients just are uncomfortable sharing feelings. Keep trying everything until we find what really helps them. Thanks.